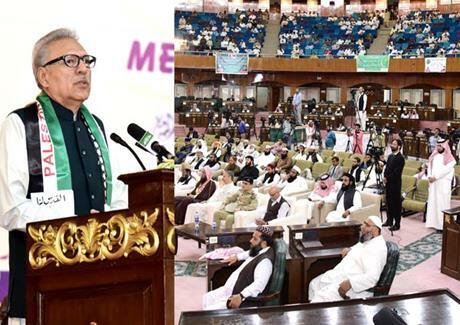 President Dr Arif Alvi Sunday said both Kashmir and Palestine would win freedom one day as no community or religion could be suppressed by force. “My heart beats with Palestine. My heart beats with Kashmir… Pakistan will continue extending moral and political support to Kashmiri people,” the president said addressing ‘Paigham-e-Islam (Message of Islam) Conference’ held by Pakistan Ulema Council here. Mustafa Al-Tawil, Saudi Ambassador in Pakistan, Nawaf bin Said Al-Malki, Chairman Pakistan Ulema Council, Allama Tahir Ashrafi, representatives of Saudi Ministry of Religious Affairs and religious scholars from across the country. The conference started with the mesmerizing recitation of Surah Rahman by Imam-e-Kaaba, who had also led Friday prayer at Faisal Mosque. use of force could not eliminate them in the 20th century. Similarly, the freedom movements in Kashmir and Palestine could not be ended forcefully. He advised the religious scholars to spread the message of social revolution from the pulpit that had been the platform for social messaging since the early days of Islam. He said the clerics must guide the people on social issues like cleanliness, water conservation and tree plantation for being the urgent needs of the country. Condoling over the loss of lives in terror attack took place in Quetta on Friday, the president said Pakistan had successfully fought out terrorism and the residues would also be eliminated. Recalling Pakistan’s generous hosting of 3.5 million Afghan refugees, he said, the world must learn compassion and humanity from Islam and Muslims as currently, some western countries were resisting to host even few dozen refugees with others erecting walls to bar them letting them die in the sea. The president said the journey of social change would accomplish only after the introduction of uniform education system in the country. Thanking the Saudi leadership for further strengthening ties with Pakistan, he said he believed that no force in the world could harm Muslims if Pakistan and Saudi Arabia stood united for any cause. Earlier, the president also gave away shields and souvenirs to the visiting dignitaries and also received the same from Imam-e-Kaaba. Minister for Religious Affairs Nurul Haq Qadri said the clerics owed responsibility to create unity among the Muslims and sensitize them on country’s rules and regulations. He said the government has resolved to protect religious seminaries and was striving for uniformed education system to uplift the seminaries’ students at par with other educational institutions. Chairman Pakistan Ulema Council, Allama Tahir Ashrafi said Pakistan Ulema Council had the distinction of issuing decree against suicide attack terming it as ‘haraam’ for the first time in year 2000. The body was also the first to give edict against Daesh, he added. He said the world must end intervention in Islamic countries on the basis of sectarian differences. Chief Judge of Palestine Shariat Council Mustafa Al-Tawil, Dr Abdullah of Saudi Ministry of Religious Affairs and the Saudi Ambassador in Pakistan also addressed the gathering.